These beautiful hand painted adverts pay homage to the days when sign writers painted advertising slogans directly onto the walls of our cities. The campaign by Ad agency CHI & Partners continues to tell Anchor Butter's story that its butter is made by working cows. 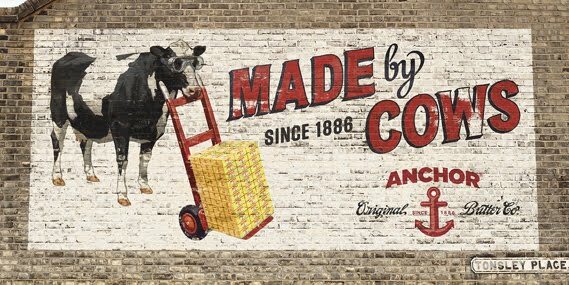 Illustrator Paul Slater and hand lettering artist Alison Carmichael (who we have featured on the creative pie before) were commissioned to create the adverts and the traditional painted style helps reinforce the message that the Anchor has been producing butter since 1886. 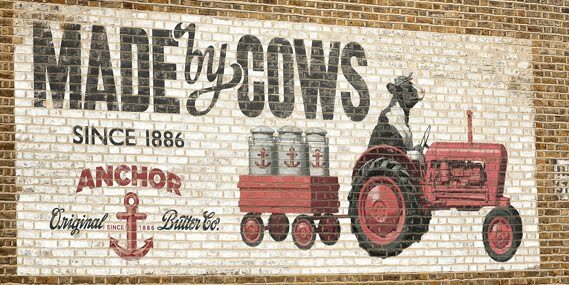 The only slight disappointment is that these adverts are actually printed and not painted directly onto the brick surface. Oh-well, still a great idea well executed. 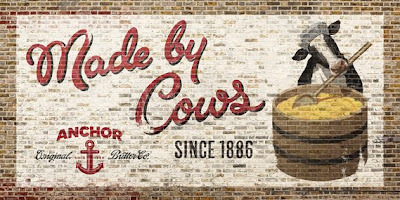 Just hope the cows approve.